You are here: Home » News » Financial News » Equities » Prophetic dream warns of sudden downturn in stock market during cold weather. Prophetic dream warns of sudden downturn in stock market during cold weather. Two days ago, November 25 2017, my son Reid dreamed he was in a large field with tall, golden grasses, indicating cold weather. He and his friend, Chase, were dressed in Ghillie suits and lying on their bellies, actively tracking a black bear. (Note: Ghillie suits are camouflaged clothing designed to resemble the background environment such as foliage.) When the bear moved, they moved. In the dream, Reid fell asleep on his belly. 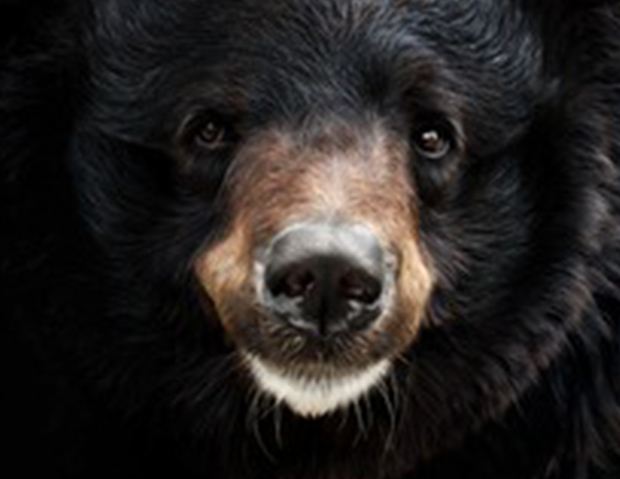 He awoke suddenly and looked up and was shocked as he was face to face, eye to eye, with the black bear, only inches apart. Reid noticed the bear’s brown eyes. End of dream. So, of course I am thinking that even people in the know, tracking the market in stealthy ways will awaken to a shock of a bear market in their face. I think of Black Monday as well. Michele Burdo, along with her husband Tony, are a music duo that have performed and shared the stage with many people in the Christian Music Industry including: Randy Stonehill, Phil Driscoll, Russ Taff, Phil Keaggy, Steven Curtis Chapman, Michael W. Smith, the Newsboys, Delirious, and many others. They are published songwriters with BMI and have had the opportunity to record and perform their songs throughout all of North America. Together they have served as Worship Leaders at various ministries. Their music can be found on: iTunes Apple Music, Spotify, and YouTube. You can also like them on FaceBook at facebook.com/BurdoMusic. Many of Michele’s lyrics are inspired from prophetic dreams and supernatural encounters with the Lord. She has a passion for communicating with others about the deep things of God. Thank you MIchele for sharing you son Reid’s dream. Very encouraging. Around 3+ weeks ago I had a bear-themed dream as well. Dream: I was in a house with other people that were familiar to me in a way (perhaps Z3 investors). I heard something at the front door and went to open it and there was a small to medium sized brown bear in the doorway. I was startled somewhat as was those in the house with me and then the bear turned and ran away. Then some time had passed with us being in the house and we heard something at the back door of the house. This time we all moved to the back door to see what it was. The door was opened and there was a huge, huge brown bear. The size of the bear took our breath away. EOD. Have been pondering over this dream for the past couple of weeks and when I saw your post and David’s post/reply, thought it was time to share it. Seems to be confirming James’ 2 market drops. I also had a bear dream on 10-10-17. I was outside the house in the dark and a large black bear chased me inside and even was able to enter the house. I took shelter in a room. In the same night I had a dream of a chicken having survived a trip in a suitcase and then having to lay and egg. Perhaps unrelated. Other dreams include a winter theme and market correction. Q mentioned 10 days of darkness. I believe the insight from Q and our dreams points to a sudden revealing of the deep state – leading to a sudden market drop. We should be prepared for a period of time where our daily lives are interrupted, not just a market correction. Food & Water & Fuel stored. Deep State takedown is a dangerous operation. An interesting dream, Jesse. May we take heed. Wow, Christine! What a dream! So, the first bear came and left, whereas the second bear coming by way of the back door and enormous in size! I think when the 2nd bear comes it will truly be shocking, even to those who are somewhat prepared. Thanks for sharing this confirmation ChristineB. Thank you for sharing. Confirmation of the dream I had about bear market coming soon. It gives me hope after horrible 2017. Thank you. Will you share your dream? I’d like to hear it. was so I googled it, bruin means brown bear. PRAISE GOD LORD JESUS CHRIST. I would like to believe it was from the Lord, regardless, I praise Him anyways for whatever He gives me. 2 bears, James’ 2 drops? The second one out of the fireplace, Jeff Byerly’s firery event for the second major drop? You were not concerned by tbe bears because you are secure in Christ. I woke up this morning with the song below singing through my head. Haven’t thought of this movie in forever, hadn’t heard this song in forever, and was like “Lord, what in the world? !” went back to sleep, woke up for good, and still had the song in my head. Looked up the lyrics and honestly didn’t think anything of it other than maybe something will happen in December…..Then I read this post. Make of it as you wish, because I or my husband don’t dabble in the stock market other than retirement and I don’t ever usually get this stuff from the Lord. But maybe it is just a way the Lord is saying heads up! Blessings. Figures dancing gracefully across my memory. Mary, if your not familiar with him, look up the Staff and the Sword Ministry (Chuck Youngbrandt). This just came to me as I was reading your comment, one of his prophecies that he gave concerning the month of December (did not know the year) that there would be an ‘accidental nuclear exchange’ between Russia and United States. The thing that caught my attention with that was that one of the indicators of the year that this would happen would be a major hurricane in the month of September possibly hitting the gulf coast. Well, we had Harvey, then the other two. He said specifically that when we saw that happen, then to expect this next. I’m not saying it will be this December. But something to give you a heads up and research his information. Also, he gives a sequence of events that happen: first would be a hurricane(s), next would be an earthquake OR could be a volcanic eruption, then finally war would follow. Very interesting stuff. Listened to His prophecy today twice. Since the hurricane happened this year. And the mussels are supposed to come the same year in December, I wonder if Mr. YoungBrandt is out warning those 4 cities? Would be interesting if there were a way to find this out. I don’t know Mary, you can get on his mailing list and they will send out updates every so often. Pastor Benjamin Faircloth’s sermon from Sunday (www.ignitedchurchlife.com) was also talking about a false flag event, similar to Jeff Byerly. The one from last Sunday is called ‘False Flag’. Might want to go listen to that one too. Yes, I listen to Pastor Fair cloth every week! Thank you. Yes! I have heard him. I really thought it was weird to have this song; I may listen to his prophecy again. Thank you so much! Thank you for sharing this lyric, Mary. It is very interesting. That is a very interesting dream! Might the Buffalo (player) in the dream also represent a bull (bull market)? I certainly hope not, Michele. This dream could be interrupted maybe as a bull market, The Buffalo Sabres defeating the Boston Bruins. Buffalo (bull) defeating the Bruins (bear). A sabre is a sword, so the sword slaying the bear. But I saw the bear in the fire place, like resting but it did not get hurt or burned. To me though it’s gotta be a down market, 2 bears in the dream, confirmation within the dream, the Bruins being a brown bear. Than again I could be totally off wrong like the last 2 years, just waiting for this manipulated market go down. Hi Michele, thank you for sharing his amazing dream. The golden grasses indicated it was in Autumn. Are your son chasing a bear market of stock right now? His dream seems imminent. I asked Him about the season of the dream. It could either be Autumn or Winter, he was not certain. Autumn this year is from Sept 22 to Dec 21. Perhaps, because he was with Chase tracking the bear, as though they’re trying to keep tabs on the bear market. Although, they were aware what was happening, Reid was still caught by surprise. Another eminent reminder that the gravy train and the hope of long term prosperity is over for Mystery Babylon. John Smith. Wow! Appreciate all the analysis! Thank you for keeping us informed. Thanks for this update John. 1 2 3 , that’s the number. December 3 ( Sunday) ? William, if that’s the case 16 Kislev 5778 starts on Dec 3rd at sundown. 29 Nov 1947 (16 Kislev 5708) was the commandment to restore Israel at the UN. Today is the 70th year on the Gregorian calendar. 16 Kislev 5778 is that day on the Hebrew calendar. I do think 12/3 could be it thought because 3 Dec at sundown is 16 Kislev 5778 is Israels 70th anniversary of the commandment to restore. 41:45 mark the missile launch out of a sub (north korea), date Dec 3rd ‘2015’ just wondering if we had a delay. Jeff byerly’s fiery event??? Or march 12th, what year and so on. I think we all see that the current monetary system is 1) not working anymore and 2) widens the gap between rich and poor and 3) feeds greed egoism materiakism instead of love. Than again we are helpless cause our only means against evil are our prayers. Therefor we wish that The Lord, our God intervenes cause we see evil is winning. Furthermore I feel there is no more turning point so I am afraid the only way for God is that we start all over. I pray that God sees that selection is also the problem cause some rich evil people bought the safest place on earth. So I pray the selection is made by heart and not by money and or location. 1. Anything you see need to change, pray , pray for it. 2. Pray , pray for more soul to be saved, come down to the person level, with the understanding that ” ( Jesus said: ) pray in my name, I will do it . ” . I meet with many people, and I know / feel that too many of them will not enter into heaven unless they change. 3. You are not hopeless. With faith, you can do all things. This is the part we need to work more on. With praying in tongues for many many hours, one will build faith up , transform from inside. This is the part we can build up. And it is the direct and detailed way, not that we can not do anything except prayer. I mean we should concentrate on building up faith level to operate on sign and wonder level, through praying in tongues for many many hours. I think we are tired mainly because we followed these prophetic insight for trading for so long, and the expected drop still not happened. When the drop indeed happens, we should have a big relief . Then we can sum up the strength again to go forward. After going through these financial difficulties, I got to understand what does ” walk through the shadows of death ” means. This is just the financial difficulties yet, not the real natural disasters , famine, cold, rioting, etc. when the real natural disasters , famine, cold, rioting, etc happen, that would be the real ” walk through the shadows of death “. So I can not emphasise more to prepare and prepare more for the coming all kinds of disasters, especially on the spiritual side. I can not emphasise more on the importance to build up the faith level by praying in tongues by many many hours to get to operate on sign and wonder level. It is not so much to care about other people view, except to care God’s view. We are running out of time for any kind of arguments. Eventually we’ll come to a time that to tell somebody ” do you want to be saved or not? do you want to receive Jesus Christ or not ” , and if the person try to argue with you, we may have to say ” forget it ” , and move to the next one. Maybe “Chase” is a word play for Chase bank as a sign. mmm …. “Chase” Manhattan Bank? New York Stock Exchange? VIX spiking 4th straight day despite massive spike in indices. Something not right. Along with many other people, my son, Reid has had about 20 dreams involving both Russian and Chinese invasion of the U.S.